This room has cable TV and a coffee maker. 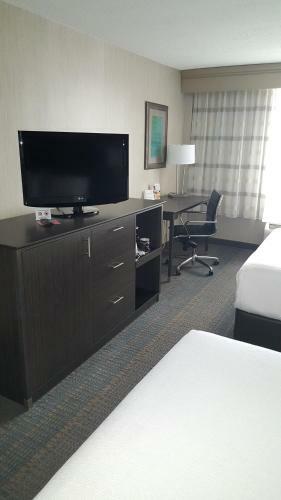 Steps from the Ohio Theater, this hotel located in Columbus offers an on-site restaurant and free shuttle service to and from John Glenn International AIrport. 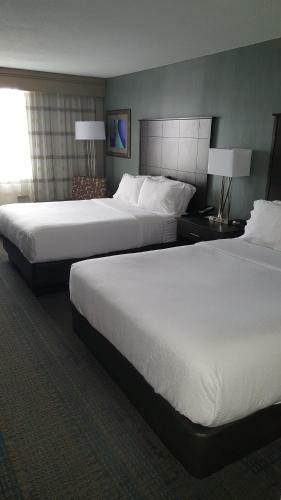 The Holiday Inn Columbus Downtown-Capitol Square features free WiFi access in each guestroom. After a day of sightseeing, relax in the indoor pool or take advantage of the 24-hour fitness centre. Breakfast, lunch and dinner are served at the hotel's Burger Theory Bar and Lounge, offering a variety of menu items. Several attractions are located a short distance from the Columbus Downtown-Capitol Square Holiday Inn including Deaf Park Topiary Garden and the Columbus Convention Center. The Arena District and Palace Theater are also easily accessible. You must show a valid photo ID and credit card upon check-in. Please note that all special requests cannot be guaranteed and are subject to availability upon check-in. Additional charges may apply. For any Room Including Breakfast: The Rate includes a coupon redeemable for breakfast in the hotel restaurant. Limit 20 US dollars per room per day. Guests are required to show a photo identification and credit card upon check-in. Please note that all Special Requests are subject to availability and additional charges may apply. Noisey guests, late at night. It's location and good service!! Good location, walking distance to some new nice restaurants. Under some renovation but did not impact stay in the hotel. I had a box shipped to the hotel for an event on Thursday night. I called Thursday afternoon and then spent 30 min at the desk as they could not find the box. All I got was "sorry it's not here". Having missed the event in question, the box was "found" the next morning after I provided the name of the person who signed off on it. Just a "sorry". Disappointed to say the least. Diner in the renovated rest. Was great..we both had steak dinner..was very good..considering burgers was main object of menu..breakfast was just as good.we prefer staying here than the Weston hotel. Nice, friendly, and great to be waited on. Breakfast was nice. Great to be waited on. Great we had a shuttle to and from our concert. Didn't have to worry about parking. We were awakened before 8 am because maintenance said we had a water leak. We did not. There was also no food to be had after returning from a concert. Chambre spacieuse, personnel souriant et à l'écoute. Le wifi marche super bien. Service de shuttle gratuit très pratique (il suffit d'appeler ou de demander à la réception) qui compense l'emplacement franchement pas terrible de cet hôtel. Esthétiquement, l'hôtel et le quartier sont un peu déprimants. J'ai regretté de ne pas m'être installée plutôt à Short North ou à côté du centre de congrès. Mais du coup, bon rapport qualité-prix. Autre point négatif : la douche qui a décidé d'être soit glacée, soit brûlante... pas d'intermédiaire ! The Staff was super nice. Everything was very clean. Breakfast was yummy and even accommodated my food allergies. The shuttle was a great. I would definitely stay here again. We really felt like everyone went out of there way to make our stay here wonderful. The hallway carpet pattern and color.......the interior designer should be prosecuted. Convenient to theater. Reasonably quiet. Asked staff for recommendation for a gluten free restaurant. Was told that they knew there were some, but they had no idea what they were. I found one a few blocks away by looking online. Luckily it was okay. Would have preferred that I had know that before I went. Employee not helpful and not concerned about trying to be. Super amazing bed, over sized and very comfortable in any position of sleeping. When I dropped chips on the floor, ants were soon on the scene. Nice location, close to downtown, but quiet and interesting neighborhood. Staff was generally friendly and helpful. Comfortable bed. Small print, VAT should be the part of the price and not excluded. Soft drink machine in the lobby was too loud. Hervorragender Service: Der Hotelbus steht von morgens bis 23 Uhr auf Abruf zur Verfügung sowohl für Stadtfahrten als auch für die Fahrt vom/zum Flughafen (15 min.). Off I-70 in downtown Ohio, this casual hotel is a 12-minute walk from the Columbus Museum of Art and 2.9 miles from Ohio State University. The modestly decorated rooms feature free Wi-Fi, cable TV, desks and coffeemakers. Some rooms have pull-out sofas, as do suites, which also add minifridges and microwaves. Freebies include an airport shuttle and kids' meals (age 11 and under) in the restaurant, which also has a bar. Other amenities include an indoor pool, a fitness room and a business center.